The structure of these two weeks involving pH growth curves and analysis was very similar to that of the previous two weeks (osmolarity). Before class, our student assistants performed dilution streaks (instead of the students) and prepared overnight cultures from those plates. The overnight cultures were used by the students for the pH growth curves. Additionally, our student assistants had to make media (at pHs 4.5, 6. 7.5, and 9) and pre-load the 96 well plates before class. 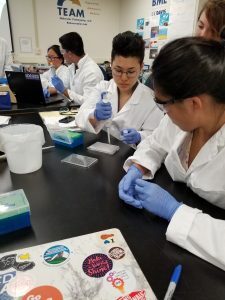 Following the same protocol from before, students were each assigned to a row in one of the 96 well plates, where each row contained 4 different pHs (4.5, 6. 7.5, and 9), in triplicate. Students added 2ul of their diluted liquid culture to each well by puncture through parafilm that was covering the wells. The following week, students graphed and analyzed their growth curves, but a couple of problems came up. First, the computer for one of the plate readers crashed during the 96-hour run and the data was not saved. For students who had samples in this plate, we asked them to just analyze the growth curves for a different bug. There were some instances of very strange readings; visible mold growth in certain wells was probably the culprit. For homework, student were asked to interpret and summarize their growth curves; the class data looks like this for osmolarity and this for pH. We had two routes that we could go down at this point during the CURE: A) Redo growth curves that didn’t work on the potentially contaminated isolates or B) continue with the samples that worked, and ID the bugs to make sure they were the same ones we started with. We chose to continue with the latter so we could give Rachel Vannette (collaborating PI) complete data on a few bacterial isolates rather than incomplete data on potentially unknown isolates. One downside to this is that some students lost ‘ownership’ by no longer working with the bug they started with. However, the skills they would learn through this process was still a favorable tradeoff. Therefore, at the end of class on Week 7, we had students set up a colony PCR by putting a colony from their plates into water. Due to time considerations, we performed the PCR ‘behind the scenes’ and instead had a discussion about what happens during PCR at the end of class. The Term Project up to this point has entered a state of completion for students: each group has submitted final drafts of their outline, figure, and narrative. In the narrative section, students were asked to cite primary literature, which we know can be very daunting at first. We decided to use remaining class time during Week 6 to talk about the importance of references and reference managers. We provided an in-class demo on getting and using the Paperpile Add-On for Google docs. We promised them that they would never have to type out references again if they used a reference manager, and as you can imagine, this was well received by the students.